Benjamin Netanyahu can’t be trusted: He says he didn’t mean what he said about Palestinian statehood, but he can’t be believed. The Israeli prime minister says he didn’t mean what he said. Even he knows he can’t be trusted. Israeli Prime Minister Benjamin Netanyahu with his wife, Sara, on March 17, 2015, in Tel Aviv, Israel. That promise helped save Netanyahu’s job. Now he’s trying to fudge it. “I was talking about what is achievable and what is not achievable,” the prime minister told NBC’s Andrea Mitchell on Thursday. A Palestinian state is unachievable today, he explained, in part because Palestinian leaders refuse to accept Israel as a Jewish state. 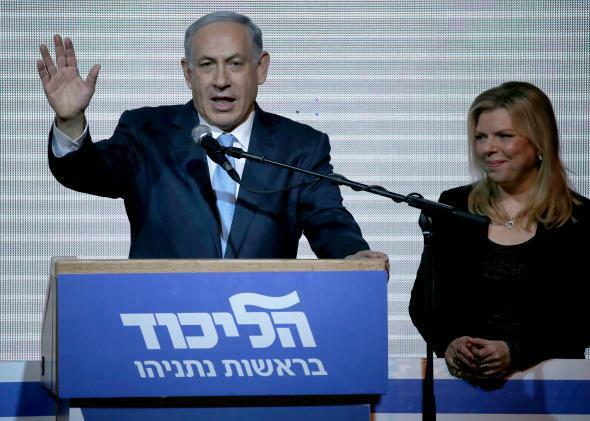 Anyway, Netanyahu’s defenders plead, what he said on Monday was just an election ploy. He didn’t really mean it. I’d like to believe that Netanyahu was lying to voters on Monday, not that he’s lying to the rest of us now. But I can’t, because in the past, Netanyahu has explained quite cogently why such post-election spin shouldn’t be trusted. He has argued that we should judge leaders by what they tell their own people. And he’s right. When a politician tells voters at election time that they won’t have to accept a land-for-peace agreement as long as he’s in charge, he’s signaling that he doesn’t think they’re ready for such an agreement—and that he won’t risk his re-election by telling them otherwise. No sensible person would expect such a man to make the necessary compromises. He lacks the courage. Don’t take that verdict from me. Take it from Netanyahu. It’s exactly what he has said about Mahmoud Abbas, the president of the Palestinian Authority. That’s a gross distortion. Abbas doesn’t refuse to “accept a Jewish state.” He accepts Israel but refuses to tell Israelis whether their state must be Jewish. Abbas hasn’t changed that position in 20 years. Netanyahu just wants to pretend it’s new, so he can deny going back on his word. Why is this recognition important? It’s important because the Palestinian leadership must begin to make clear to its own people that they are making a permanent peace with the Jewish people. … President Abbas has to decide. He cannot skirt the issue. He cannot find clever language designed to obfuscate or to fudge it. He needs to recognize the Jewish state. He needs to say it clearly and unequivocally. He needs to say it to his own people in their own language. It is time for President Abbas to stand before his people and say: “I will accept a Jewish state.” Those six words will change history. They will make clear to the Palestinians that this conflict must come to an end, that they are not building a state to continue the conflict with Israel, but to end it. They will convince the people of Israel that they have a true partner for peace. Netanyahu was right. Legally, under the Oslo Accords, Abbas didn’t have to recognize Israel as a Jewish state. But politically, his refusal to do so cast doubt on his people’s commitment to a permanent agreement. If Abbas wasn’t willing to tell his people that they would have to accept an officially Jewish state, with no right of Arabs to reclaim ancestral lands inside Israel, what did that say about Palestinians’ understanding of what they were agreeing to? If Abbas didn’t believe his people would accept this concession, and if he wasn’t willing to lead them by example in coming to terms with it, why should Israelis believe Palestine would honor the deal? Now the roles are reversed. Technically, Netanyahu has accepted a Palestinian state. But he keeps finding reasons—the “Jewish state” issue, the Fatah-Hamas unity agreement, the rise of ISIS—to insist that “conditions” aren’t right. And when the chips are down—when he has to face his own people, with re-election on the line—he tells them they won’t really have to accept Palestinian independence. He does this because he believes they aren’t ready to accept it, and he isn’t willing to prepare them for it. He doesn’t have the guts. An Israeli prime minister who’s serious about peace can’t run around giving post-election interviews to cover up what he told his voters. He can’t skirt the issue. He can’t find clever language to obfuscate or fudge it. He needs to recognize a Palestinian state, not in some magically transformed Middle East, but in the Middle East as it is. He needs to say it clearly and unequivocally. He needs to say it to his own people in their own language. He needs to make clear to Israelis that he, not some future prime minister, will pursue negotiations not to continue the occupation, but to end it. Only then will the people of Palestine be convinced that they have a partner for peace.